One of the big hits of 2016 was the "open-ended country-life RPG," Stardew Valley. 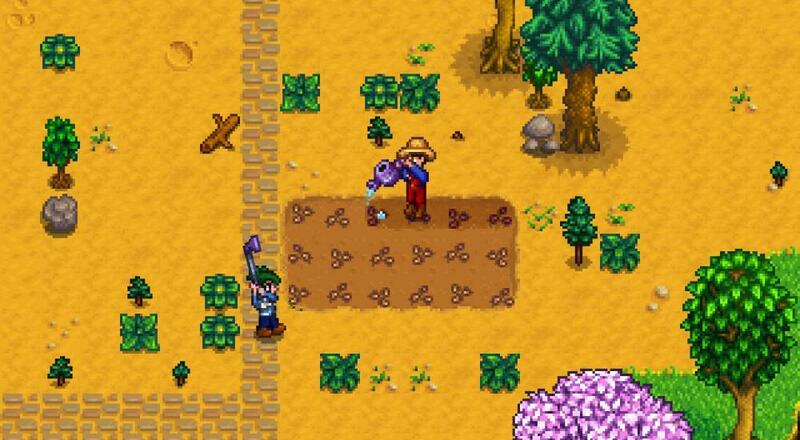 This labor of love from one-man development team ConcernedApe let players own and operate their own farm while also engaging in other activities like romancing the local townsfolk and throw some festivals. While it is a single-player only affair, there's some good news on the way: co-op will be implemented sometime next year. In a blog post today, the game's publisher, Chucklefish, revealed their plans for adding co-op. When the feature gets added (more on that in a bit), up to three online players will be able to join another player's game as farmhands. These farmhands will be able to "farm, mine, fight, fish, forage, marry NPCs and take part in festivals." Farmhands will also have their own inventory, which can be managed by the host when your buddy isn't connected. Also worth noting is that "certain decisions can be made only by the main player: when to sleep, when to start and end festivals, and whether to side with Joja, for instance." This will be online co-op, only, too. It's specifically stated in that post that "[l]ocal multiplayer, split-screen... are not planned at this point." At the moment, this feature isn't in any version of the game. The current plans are to beta test this on the PC later this year and then fully release it in 2018 as patch 1.3. Once the PC version is squared away, the Nintendo Switch will be the next console to receive the co-op update, followed by the PlayStation 4 and Xbox One. We'll keep an eye on all this as it develops, and spread the good co-op word as more information becomes available. Page created in 0.8519 seconds.